If you are anything like me you can't sleep if you are too hot or too cold, my children are just the same, they always sleep better when they are warm and cosy and the room is not too hot. When the Little ones were babies I would often worry about the temperature of the nursery and if they were in the right clothing or correct tog Grobag and go in to check them. On more than one occasion I accidentally woke them in the process feeling the back of their neck or if their face was cold. I did have one of those paper thermometer things but it never gave an accurate reading and wasn't reliable plus I could never see it in the dark. Recently I was given the opportunity to review the Gro-egg from the Gro company and I can safely say we love it and it will be a must have nursery item for our when Little 3 makes an appearance in a few weeks time. The Gro-egg is a digital colour changing room thermometer and just one look is all you need to see the temperature of your childs room and adjust the heating, window or bedding accordingly, no more feeling their neck and risking waking them up! The correct room temperature is important for your child as Health professionals say a room temperature of 16-20 degrees (61-67 fahrenheit is safest for your sleeping child to reduce the risk of SIDS (Sudden Infant Death Syndrome). The Gro-egg glows yellow when the room temperature is within these guidelines and changes colour when the temperature falls above or below this so you can see at a glance the temperature of your child's room. 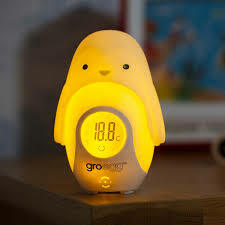 The Gro-egg is a lovely size just 70mm by 110mm and sits discreetly anywhere thanks to the long power cable provided, it has an on/off switch underneath and so can be easily turned off if necessary and registers the temperature immediately as soon as it is turned back on which is easy to see on the clear display. The instructions come with a handy guide as to what clothing and bedding/Grobag tog your child needs depending on the temperature so it is handy too. Initially our Gro-egg was going to be tested by Little 2 who's bedroom is definitely the coolest being at the back of the house and then passed to Little 3 for use in the nursery when the time comes but I think we will be having to invest on another one as Little 2 loves her egg nightlight so much! Little 2 is afraid of the dark and has been since she was around 19 months old (you can read about that here) and having gone through several different nightlights in the past year I have to say I really like the Gro-egg as a nightlight too. It doesn't light up the room like a Christmas tree as some we have tried and it has a reassuring glow that she can see easily rather than being a little thing plugged into a socket where she can't see it. I can see it is going to be a handy light in the nursery to peep in on the baby too. The Gro Company also sell 'egg-shells' for your Gro-egg to turn it into a friendly nightlight, a soft flexible plastic cover shaped like an animal. We invested in the Percy penguin one after trying our Gro-egg for a few days and realising how much Little 2 liked it and now it is definitely not going to be allowed to move to the baby's room! For more information about the Gro-egg and other Gro Company products please visit www.gro.co.uk and for further information on SIDS and safe baby sleeping head over to www.lullabytrust.org.uk. N.B I was sent a Gro-egg free of charge in return for this review. We purchased our 'egg-shell' ourselves.